Let's hand it to all the teachers who taught before the internet. - Be your best teacher! 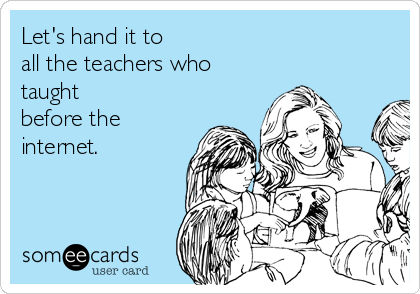 Let’s hand it to all the teachers who taught before the internet. Saturday Morning Musings. This is how I feel about teaching and parenting. How did you do it before the internet and Pinterest? Honestly? It’s amazing! Its hard enough to do it now. That is what tupperware parties were really for right? Cheers to you and thank you internet. I always love a good teaching meme! Previous Post Make your grading more efficient!